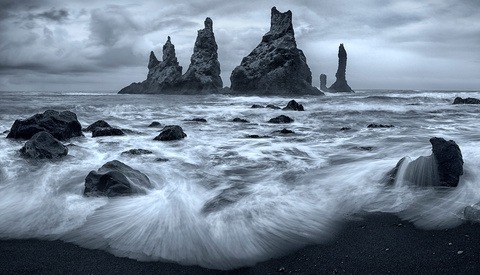 For the past three years, I have visited the UK and Norway once, and Iceland and the Faroes on several occasions. 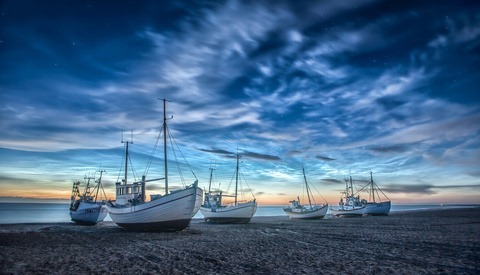 What these locations have in common is water, and not just in the sea, in the air also. Top that off with some crazy cold wind and you know you are in for a treat photography wise. 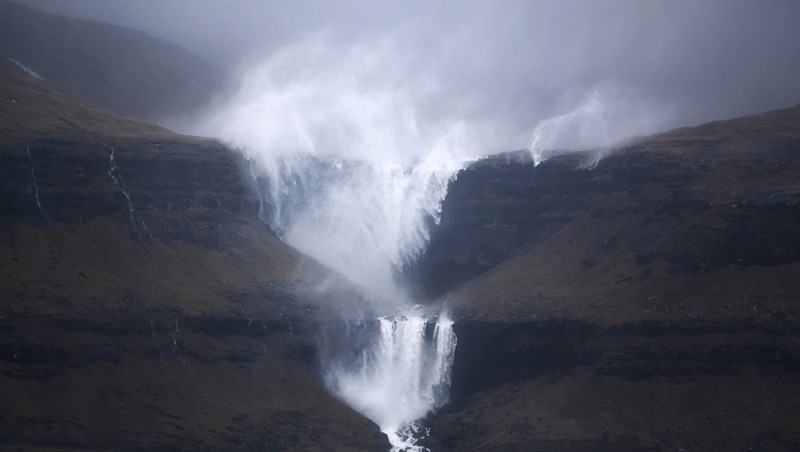 Back in December, when I visited the Faroe Islands the forecast predicted sideways winds and loads of rain. An obvious day to stay indoors underneath a blanket and watch some Photographing the World. Me being in the Faroes that is simply not an option. 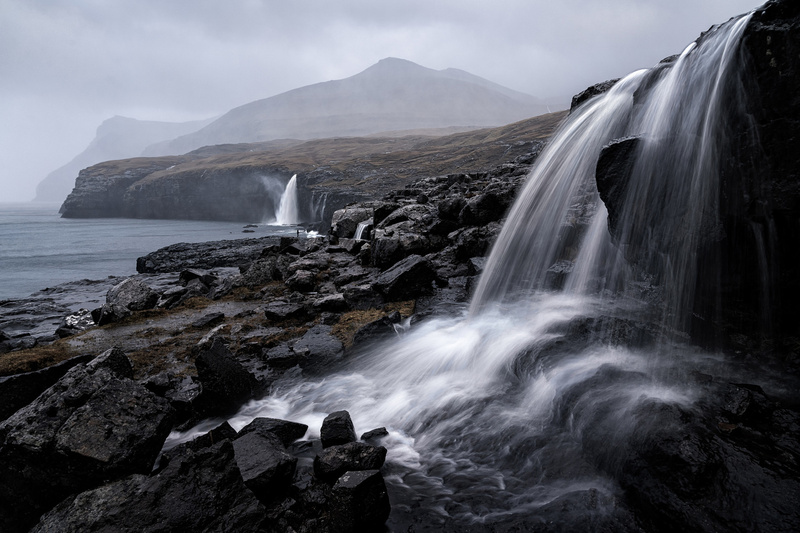 I knew the waterfalls ought to be full so I went out into the storm with the local Thomas Vikre to explore what the mountains could throw off. 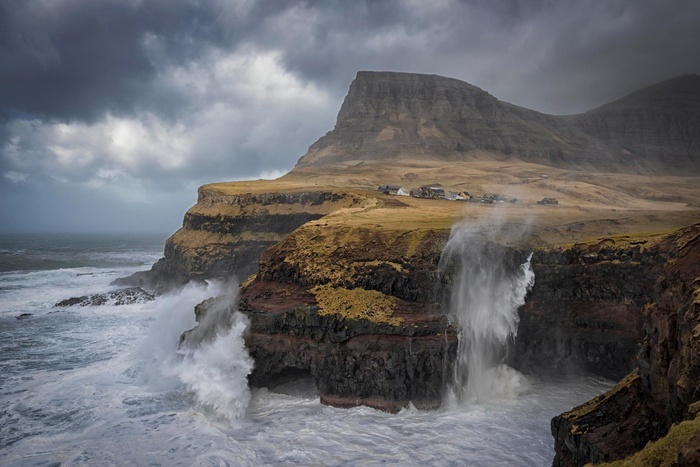 We headed over to the largest waterfall in the Faroes, Fossa. Fossa is a fascinating waterfall divided into several plateaus. It is easy to find, as it is located next to the road. On arrival both Thomas and I was impressed with how the winds pushed half the waterfall back up the mountain. I initially wanted a photo with a person standing on the upper plateau, but we both deemed it irresponsible to do that in the strong winds. 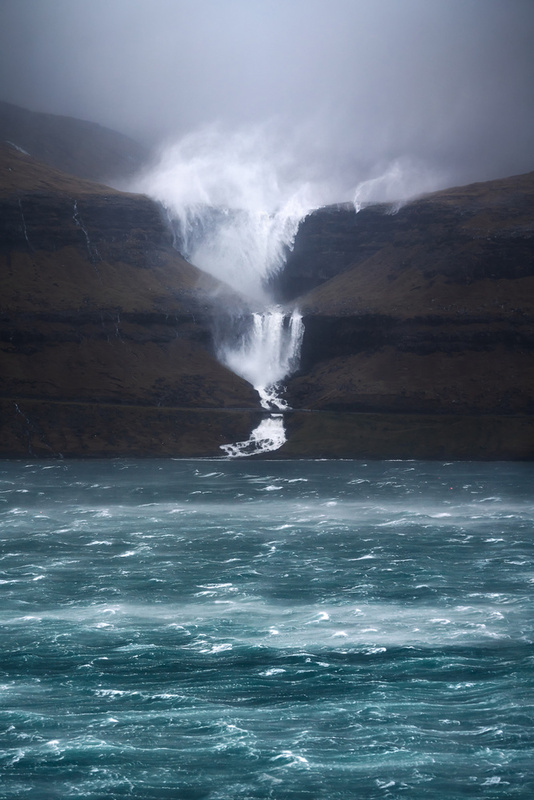 We headed over to the neighboring islands, Eysturoy, where there is a straight-on view of the waterfall. To get the photo I wanted I had to use my 70-200mm. I had to seek shelter behind a small shack because of the strong winds. Even then I had to raise the ISO to 640 to get a fast enough shutter speed and fire off in continuous shooting to get a sharp photo. 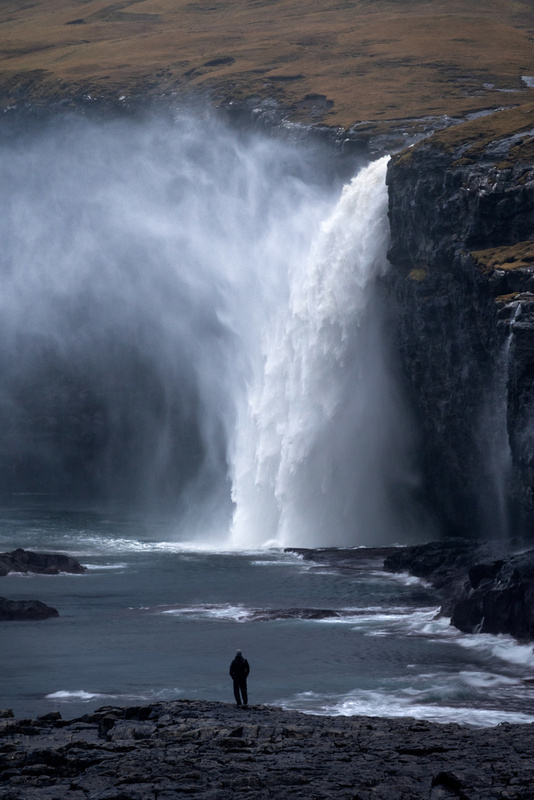 I love how the wind throws the water from the waterfall around and the foreground fjord is as unruly as it is. Lots of drama and atmosphere in a simple and minimalist photo. We continued up the road towards a small settlement called Eidi. During conditions like this, the waterfall behind the settlement fills up and becomes an impressive sight. I had already visited this location back in spring 2017, but I had never photographed it with a long lens. I stayed back to keep the dramatic perspective intact and had Thomas pose for me on the foreground plateau. I again used the 70-200mm and zoomed all the way in to 200mm. I had to collapse my tripod and keep it close to the ground for it to resist some of the smaller gusts. When I had the shot I wanted, I found another small waterfall I knew was in the area. Inspired by Nigel Danson's photo (credits worth credits due) this photo was just too hard to resist. I knew this weather would be near optimal conditions to get this shot. I tried to pull as far back as possible and zoom in to compress the scene as much as possible. Battling the rain and wind, which threw water from the small waterfall onto my camera I settled with 24mm. Being completely soaked and with wet camera gear, I even had moisture inside my phone camera, we decided to call it a day. I fully admit I was a bit skeptical if the effort was worth it, when we left the last location. After a little post-processing, the photos came out fantastic and my skepticism was again unwarranted. Surely "bad weather" delivers some fantastic photos. Have you ever been out in such “terrible” weather? Did you get some great photos? Write down below. 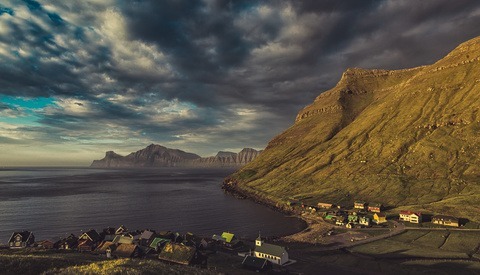 As crazy as it gets in my beloved Faroe Islands and so much fun in the process too! Although we did manage to get slightly wet 💦 Love the images you managed to capture Mads. Gorgeous shot of Gasadalur! I have yet to get a proper photo from there I am 100% satisfied with. Epic stuff, love this kind of thing. Awesome images, especially the first one. It's nice to see really unique images that show the power of nature. Thank you, Michael! Yes, it can actually be fairly hard to transfer that crazy power unto a photo. Great shots, Mads. You beat me to this kind of article. 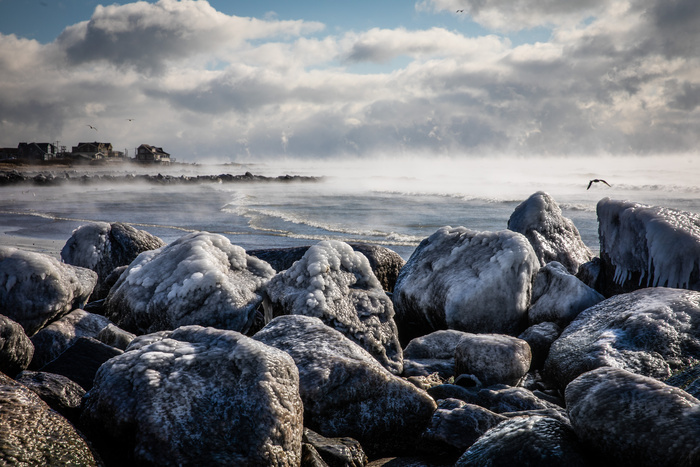 My camera is in the shop right now getting a good cleaning after shooting some zero-degree weather with high winds on the beach that created some astounding sea smoke. The 5DMKIV is a pretty rugged rig but, man, that sand just gets into every tiny crevice. Very nice pictures, thank you for the article. You're very welcome, Johan! And thanks a lot. Great read and fantastic shots! Did it for the first time last week. Got drenched, but was worth it.